The Food and Drug Administration is a huge federal bureaucracy overseeing the safety and efficacy of more than a trillion dollars’ worth of consumer goods annually, ranging from medicines to cosmetics to foods, vaccines, and veterinary products. But you should think twice before believing that the FDA has only your best interest at heart. Over the past 25 years the ties between the FDA and Big Pharma have become increasingly cozy. Starting in 1992 with the Prescription Drug User Fee, the FDA began charging for drug approval, a cool $2,374,200 per drug as of 2016. This certainly gives the impression of a quid pro quo relationship (even if it doesn’t exist). Additionally, appointing folks who used to lobby and conduct research for Big Pharma into key leadership positions within the FDA reeks of conflict of interest. For example, in 2009, President Obama appointed former lobbyist and Monsanto executive, Michael Taylor, as Deputy Commissioner for Foods. Then, in February of this year, Robert Califf was promoted from his position as Deputy Commissioner for Medical Products and Tobacco to head the agency. This is interesting because, in a former life, the Duke cardiologist and researcher had financial ties to Eli Lilly, Merck, and Novartis, among others, and served as a board member and consultant for Faculty Connection LLC, a company whose sole purpose is to help pharmaceutical companies evade and manipulate FDA regulations. Isn’t this akin to putting the wolf in charge of the hen house? Of course, none of this started with Obama. Similar issues plagued the Bush administration where the FDA chair proved a difficult position to fill. Lester Crawford served just 2 months before resigning, and for nearly half of Bush’s tenure, the FDA chair remained vacant. 61% knew of cases in which Department of Health and Human Services or FDA political appointees had inappropriately injected themselves into FDA determinations. 60% knew of situations where commercial interests had attempted to induce the reversal, withdrawal, or modification of an FDA determination. 40% felt that they could not express public health concerns without fear of retaliation. Fewer than half (44%) reported respect for the integrity and professionalism of FDA leadership. Wow, and I thought morale in the ER was lousy. Compared to the FDA we’re as happy as pigs in slop. The pressure to approve drugs has gotten so bad that, in 2009, the Wall Street Journal reported on a letter received by President Obama’s transitional team leader, John Podesta, in which nine FDA scientists alleged that managers ordered, intimidated, and coerced them to manipulate data in violation of the law, further stating that the FDA is “fundamentally broken.” Regardless of the truth of their allegations, the fact that they were made is cause for concern. Despite the expense, time, and red tape involved with drug approval, the hurdles aren’t all that high. A drug need show only that it is safe and more effective than a sugar pill to gain the FDA’s blessing. But what is “safe?” Rezulin, a diabetes drug with a monthly prescription rate of 300,000, was pulled 3 years after its approval in 2000, due to a mere 90 cases of Rezulin-associated liver failure and just 63 deaths. The overwhelming majority of patients taking the drug benefited from it. Just 1 in 23,000 patients experienced liver failure, and yet this was enough to get the drug pulled. Meanwhile, t-PA, a clot dissolving drug used to treat stroke, remains on the market and heavily promoted by the American Stroke Association despite causing fatal brain hemorrhages in 1 in every 33 patients who receives it. Even under the best of circumstances, the drug is only marginally effective, helping just 12% of stroke patients. In 10 of the 12 major randomized controlled trials, thrombolytic drugs like t-PA fared no better, or performed worse, than a placebo. But the FDA put its faith in the 2 trials with positive findings. There are no trials showing a mortality benefit; the fatality rate is about 1% higher in patients receiving t-PA than in those who don’t. Although the data suggests t-PA fails on both safety and efficacy counts, it remains the first-line agent used to treat stroke at every major stroke center in the country. Whereas, I’ve seen several deaths from t-PA, I’ve seen no cures. And still the band plays on. With all the forces of greed aligned against it, perhaps we should be thankful that the FDA gets it right as often as it does, but the agency can do better. New drugs are approved based on data supplied by manufacturers and selected peer review studies, so it’s not fair to blame the FDA if the data provided has been fudged, smudged, or smeared. Even when the data is accurate, there may not be enough of it. Most of the time there simply aren’t enough test patients to reveal all the side effects destined to surface once the drug gains a wider audience. This is why a post-market surveillance system is so important. 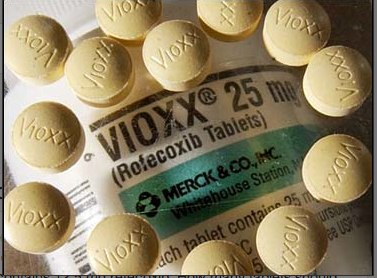 An example where both the FDA and the manufacturer failed to protect the public is the drug Vioxx (rofecoxib). Coming on the heels of Pfizer’s blockbuster drug Celebrex, Merck’s copycat version, Vioxx, was approved by the FDA in May of 1999 to treat inflammatory pain, promising fewer GI side effects than traditional NSAID drugs like naproxen, ibuprofen, and aspirin. It won FDA approval after just 6 months (usual time 10 to 12 months) based solely on unpublished, non-peer review data supplied by Merck. And just like Celebrex, Vioxx became a blockbuster, garnering sales of $280 million during its first year, on it way to $2.5 billion in annual sales. Questions regarding Vioxx’s safety, however, emerged almost immediately with publication of the VIGOR (VIoxx Gastrointestinal Outcomes Research) Trial. The goal of the study was to demonstrate Vioxx’s superiority over a traditional NSAID (naproxen) with regard to GI side effects when used to treat rheumatoid arthritis. And Merck was certainly pleased when their drug passed this hurdle, showing a 50% reduction in clinically relevant GI events like ulcers and GI bleeding. Unfortunately, compared with the much cheaper naproxen, Vioxx-takers suffered a five-fold increased risk of heart attack (0.1% vs 0.5%). Merck spun this to mean that naproxen must be cardioprotective, because the alternative was to admit that their billion-dollar baby was killing people. Merck dug in its heels, starting with a press release issued in May of 2001 entitled “Merck Reconfirms Favorable Cardiovascular Safety of Vioxx.” But there was nothing favorable about the drug. It was expensive, it didn’t work well to relieve pain, and it caused heart attacks. As the evidence mounted, so did the lawsuits. After initially standing behind their claims, Merck ended up pulling the plug on Vioxx less than 4 ½ years after its approval. A year later, researchers with access to Kaiser Permanente’s huge data base of patients, proved that naproxen was not protective, that Vioxx was harmful, and that the drug was likely responsible for between 88,000-140,000 heart attacks and cardiac deaths during its short-lived life. It took until January of this year for Merck to settle the last of the class-action lawsuits, agreeing to a payout of $830 million, raising the company’s total expenditures for lawsuits and government investigations to $8.5 billion—pretty much wiping out all of the drug’s prior earnings. Could this debacle have been prevented? Merck may not have been culpable in knowing the cardiovascular dangers when it first filed for FDA approval, but it certainly put on blinders afterward. Once a drug is on the market, post-market surveillance continues with companies required to report safety data to the agency at quarterly intervals for 3 years. The FDA also relies heavily on its Adverse Event Reporting System, a voluntary, anonymous, non-peer-review system wherein manufacturers, doctors, and patients can report adverse events through the FDA’s website (see: www.fda.gov/Safety/Medwatch/HowToReport/default.htm). The data is reviewed quarterly by scientists at the Center for Drug Evaluation and Research who then report on their findings. The FDA has the authority to require manufacturers to conduct additional safety trials, but the agency never requested anything from Merck. Meeting in August of 2001, more than 2 years after the drug’s approval and more than a year after the VIGOR Trial, the FDA’s Arthritis Advisory Committee pointed no fingers and requested no safety studies. Meanwhile, Merck kept its head in the sand and continued pouring $100 million annually into direct-to-consumer-advertising (another reason why this practice should be banned). Each time a new study appeared reporting on the cardiovascular dangers of Vioxx, Merck predictably and unashamedly pooh-poohed the science. But it was Merck who was guilty of bad science having funded their own seeding trial to promote Vioxx’s use. Such trials are not designed to further scientific inquiry, but rather to promote drug sales. To get around the illegality of outright bribery, drug companies pay doctors to enroll patients into a trial, ostensibly to look at some property of the drug—safety, efficacy, comparative effects—it doesn’t really matter; the real purpose is to get physicians into the habit of writing for the drug. After a review of Merck’s internal documents, a group of independent researchers concluded that the Merck sponsored ADVANTAGE Trial “was actually a sophisticated marketing tool designed to allow optimal ‘seeding’ of positive experiences among primary care physicians.” Shame, shame, shame. So the Vioxx thing happened a long time ago. Isn’t it safer today? The short answer is no. Avandia, a diabetes drug, remains on the market despite a plethora of lawsuits and a study showing a 43% increased risk of heart attack with its use. A similar diabetes drug, Actos, has been associated with an increased risk of heart failure and bladder cancer. It, too, remains on the market. And there are many, many more examples. What can we learn, and what can be done? First, these episodes show us that shareholder pressures on pharmaceutical companies to recoup R&D costs and generate profits are enormous. When companies spend more on marketing than they do on R&D, that’s a problem. Unfortunately, it’s not one that can be solved by letting the markets fend for themselves. In a for-profit healthcare system, greed will always trump science, so unless we want to eliminate privately owned pharmaceutical companies altogether, we are stuck with regulating them. Simple fines won’t cut it. Here’s a partial list of some of the more recent fines imposed on the pharmaceutical industry: Nov. 2011, Merck, $950 million; May 2012, Abbott, $1.5 billion; Jul. 2012, GlaxoSmithKline, $3 billion; Oct. 2012, Boehringer Ingelheim, $95 million; Dec. 2012, Amgen, $762 million; Dec. 2012, Sanofi-Aventis, $109 million; Nov. 2013, Johnson & Johnson, $2.2 billion; Feb. 2014, Endo, $193 million. Get the picture? Fines of even a billion dollars aren’t adequate to induce these companies to clean up their act. Without jail time, don’t expect things to change. Third, it is vital that we, as a society, continue to finance independent research. More than 80% of all trials are now industry sponsored. Trials demonstrating positive findings are 5-times more likely to be published than those with negative findings, although it is the latter that often provide the more relevant information. Encourage your congressman to continue funding independent research. Most breakthroughs are serendipitous. Research for knowledge’ sake is far more likely to generate new findings that can then be used for clinical application, whereas research for profit simply introduces more “me too” drugs into an already crowded market. Fourth, these examples show the importance of maintaining vigilance. Side effects, both good and bad, often only become manifest when hundreds of thousands of people begin taking a drug. The FDA must be free and willing to impose after-market studies without fear of industry reprisal. Consider that after the FDA approved the diabetes drug Januvia (sitagliptin) in October 2006, Merck had a fully functional website up and running within 90 minutes, drug reps were seeing physicians regarding the drug’s use within 2 days, at which point webcasts and educational programs were already airing on the internet. By day 8, Merck had reached 70% of their target physicians, and shipments of the drug were stocked on pharmacy shelves. By week 2, Merck had discussed their drug with managed care organizations responsible for 73% of the entire insured US population. By the end of the first month, 20% of all new diabetes prescriptions written by endocrinologists and 14% of those written by primary care physicians were for Januvia. If drug companies can achieve such amazing efficiency and success in their efforts to make money, we should be able to employ similar tactics to save lives. In the meantime, remain skeptical of pharmaceutical ads, and don’t forget that the best way to prevent yourself from becoming a guinea pig is to engage in a healthy lifestyle. Instead of medicating, try meditating. Instead of running to a doctor, try running to a park. You’ll thank me; no, seriously, you will. “Voice of Scientists at FDA: Protecting Public Health Depends on Independent Science,” Union of Concerned Scientists: Citizens and Scientists for Environmental Solutions, 2006; Cambridge, MA, ucsusa.org. Alicia Mundy and Jared Favole, “FDA Scientists Ask Obama to restructure Drug Agency,” Wall Street Journal, Jan 8, 2009, online.wsj.com. A. Faich et al., “Troglitazone (Rezulin) and Hepatic Injury,” Pharmacoepidem. Drug Safety 2001: 10 (6): 537-47. The National Institute of Neurological Disorders and Stroke rt-PA Stroke Study Group, “Tissue Plasminogen Activator for Acute Ischemic Stroke,” NEJM 1995; 333 (24): 1581-87. Claire Bombardier et al., “Comparison of Upper Gastrointestinal Toxicity of Rofecoxib and Naproxen in Patients with Rheumatoid Arthritis,” NEJM 2000; 343; 1520-28. David Graham et al., “Risk of Acute Myocardial Infarction and Sudden Cardiac Death in Patients Treated with Cyclo-Oxygenase 2 Selective and Non-Selective Non-Steroidal Anti-Inflammatory Drugs: Nested Case-Control Study,” Lancet 2005; 365: 475-81. Kevin Hill et al., “The ADVANTAGE Seeding Trial: A Review of Internal Documents,” Ann Intern Med 2008; 149: 251-8. Eric Topol, “Failing the Public Health—Rofecoxib, Merck, and the FDA,” NEJM 2004; 351: 1707-11. Simon Maxwell, David Webb, “Cox-2 Selective Inhibitors—Important Lessons Learned,” Lancet 2005; 365: 449-51. David Kao, “What Can We Learn From Marketing Efficiency?” BMJ 2008; 337: a2591. This entry was posted in Uncategorized and tagged drug safety, FDA. Bookmark the permalink. Good to get a little dental perspective, especially since FDA oversight affects all of us. Thanks for writing!